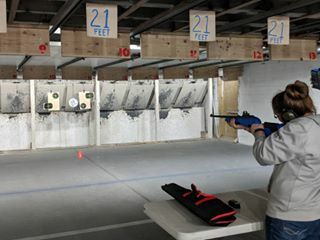 The Binghamton Rifle Club Rimfire Challenge League is fashioned from the Rimfire Challenge Shooting Association (RCSA) Rimfire Challenge, adapted to be shot in our range. Competitors in Rimfire Challenge use two guns in a match, a .22 LR pistol and / or a .22 LR rifle. Each course of fire, or stage, is shot with a pistol, then a rifle. 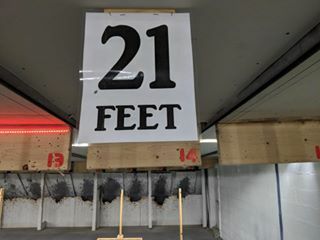 Competitors shoot each stage from a shooting table positioned about 40 feet from the backstop, on the range, and each stage consists of five steel targets affixed to the backstop. Each stage is shot five times, or strings, and the raw time for each string is recorded. The scores for all strings are totaled up, with the best four of the five strings becoming the total score for that string. The five steel targets includes one stop plate, which is shot last, ending the string. Open: Allows for the use of red dot sights and other optics on either your rifle and / or pistol. Limited: Requires iron sights to be used on both guns. Replacement sights are allowed as long as they meet the requirements of the factory iron sight notch-and-post style sight. The League runs in the months that the Two-Handed League is off, on Wednesday evenings as club availability allows. Check out the Rimfire Challenge Shooting Association (RCSA) website for additional information on Rimfire Challenge. Click here for the Rimfire Challenge Shooting Association web site.